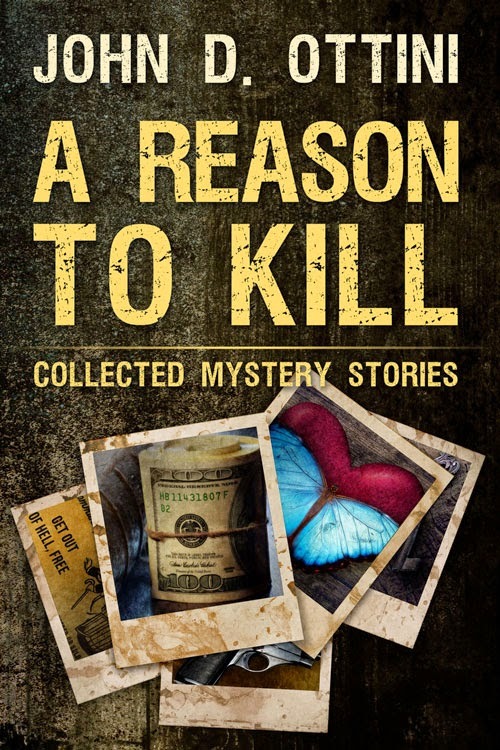 Today we are interviewing John D. Ottini, author of 'A Reason to Kill,' a collection of mystery stories. My name is John D. Ottini, I was born in Northern Italy, raised and educated in Canada, and currently reside in Central Florida with my wife and mischievous kitty named Bella. I have published three mystery novellas in e-book format, My Journey to Hell, A Fool and His Money and The Object of Your Desire. All are available from the Amazon Kindle Store. My short story 'Slipper's Last Breath' was selected and published in the 2014 edition of the Holiday Tales Anthology by Firestone Publications (available from Amazon in paperback and e-book format). I’ve always been fascinated by ordinary people behaving badly. Why do perfectly rational people who know the difference between right and wrong, still choose the wrong path? The lead characters in these stories are a prime example of what I’m talking about. When faced with everyday problems such as a destructive marriage, personal addiction, unemployment, financial debt, lost love or a bad sexual liaison, the choices they make can change their lives for the better or drag them into a living nightmare. The stories are a fast paced combination of mystery and suspense. They highlight the frailty of the human mind when confronted with the choice between good judgment and bad behavior. Interesting characters, in everyday situations, presented with a dash of humor and a splash of ‘who done it’, make for one fun read. Anyone who enjoys a good mystery book which consists of many twists and turns and a gotcha ending will love this book. If you figure out ‘who done it’ before the end of the story, then I haven’t done my job. What got you interested in writing mystery? Growing up I’ve always loved reading mystery novels or watching a good mystery movie. I take pride in trying to figuring out the plot and I’m always impressed when the writer can keep me guessing until the very end of the novel. Your new book, “A Reason to Kill,” is a collection of mystery short stories. What attracts you to the short story format? Actually, the stories fall into the ‘novella’ format, because they are much longer than the traditional short story. I’m not necessarily attracted to the short story or novella format, but that’s just the way the stories have come to their nature conclusion. In other words, I don’t start out by thinking I’m going to write a novella, I just write a story and when I feel it has reach a satisfactory conclusion, then the story is complete. At that point, depending on the word length, it will be categorized as a novel, novella, novelette or short story. Your collection has a theme of ordinary people going down a negative path. What drew you to write about this theme? As I mentioned earlier, I’ve always been fascinated by ordinary people behaving badly. Why do perfectly rational people, who know the difference between right and wrong, still choose the wrong path? Why do people rob convenience stores fully exposed, stare into the camera and somehow expect not to be caught? I guess the main questions behind my stories are - What the hell was I thinking, when I did what I did? Why did I think I could get away with it? Do you have a favorite short story in your collection? My favorite story is ‘A Fool and His Money’ because anyone who has been in love can sympathize with the plight of the lead character Thomas O’Connor. We have all done crazy things for love, perhaps not as crazy as Thomas, but I think we understand where his heart is and why he would go to such lengths without seeing the error of his ways. Having said all that, I’ve been told by a reliable source (my wife) that the ‘The Object of Your Desire’ is by far the best story in the book. Is there an author who had a major influence on you while you were growing up? Not so much when I was growing up, but when I was older I loved reading anything by the late great detective/mystery novelist Robert B. Parker. He had a smooth almost effortless style of writing, where he could tell the whole story through fast paced and witty dialog. There were no wasted words in his novels and no segues into useless descriptive paragraphs which add nothing to the overall storyline. I try to emulate Mr. Parker’s style in my stories, whether I have been successful in doing so, I’ll leave for my readers to decide. Yes, I want to clarify that each novellas in this paperback book was previously released as an individual e-book and is available in the Amazon Kindle Store. If you’ve already read my e-book novellas, then buy this book if you want a paperback copy of the stories.